style and comfort . . .
"...the best Holiday I had been on in years... this is a trip you should take more than any other I can think of right now". Melinda Stevens, Editor, Conde Nast Traveller magazine. Currently sailing south from Istanbul through the Greek Dodecanese to southern Turkey. Available for hire with skipper. For up to 10 guests. We can tailor the holiday to your exact requirements, from trips involving short hops along magnificent coastlines, to long offshore passages. 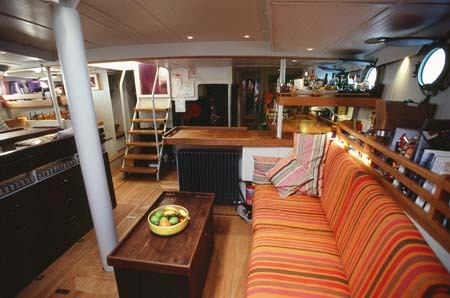 Calypso is a large ocean-going houseboat. She can support you and your group in style and simple comfort for weeks at a time in the wildest places. Alternatively, moored up in the harbour at heart of an old town or port-city, she makes the perfect base for exploring. In our experience, the best trip is a combination of the two, moving from place to place when the mood takes. Calypso can effortlessly transport you from deserted bay to buzzing town and back, as you choose. She is so large and stable even non-sailors will enjoy a journey under sail. 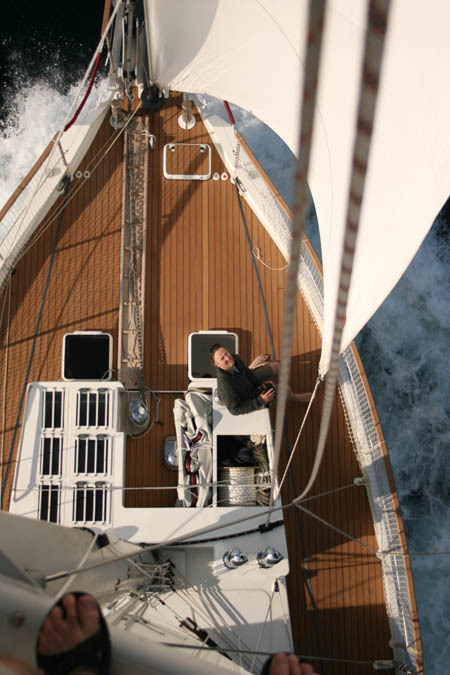 If you like an action-packed holiday, Calypso is well equipped. Activities include; exploring towns, cities and ancient ruins, fishing, water-skiing, doughnutting, swimming, snorkelling, spearfishing, and of course sailing. Alternatively you may prefer to simply relax, swim and sunbathe. Calypso is currently exploring the Eastern Aegean. Between 2013 – 2016 she will visit Greece, Turkey, Sicily southern Italy, Montenegro and Croatia. If you are looking for a holiday with a difference, if you want to explore wonderful places, if you like luxuary but crave adventure, Join the Calypso odyssey..